We were just roaming around for a good job to park my car, when WDP4 #20030 rushed past working SHF with the Madgaon bound Mandovi Express - THAT WAS REAL HARD LUCK! We were totally disgusted, and slowly walked towards the tracks, just about 50 metres from where I parked by car! Passengers waiting on the platform of the nearby Navade Road railway station meant that the Roha passenger was yet to go! We walked may be around 100 metres away from the stations. To describe the location a bit: It was about 2 kilometres of straight track visible with a down gradient and then an UP gradient in quick succession. The track then takes a curve to the right. The section is double lined, and the clearance between the two tracks seemed to be too narrow - ruling out EMU services completely! Both the sides of the tracks have wild growing bushes and we had absolutely no place to stay away from the track! To add to our misery was the fact that the line was an open ar toilet for villagers around! So, each step had to be kept carefully! Our first spotting came at 10:14. That was the Roha Passenger, and the loco in charge was WDM2 #18041 of Kalyan! This loco is the oldest working WDM2 in India - The second loco of the class to be built! The train approached us at around 65-75kmph, and came to a grinding halt in a matter of a minute! The loco smoked out to the station for a scheduled halt as we continued our spotting. About 14 minutes later, WAG7 #27622 of New Katni Junction (henceforth referred to as NKJ) rushed towards Panvel with a container train. Mayur was dying to see a WDG3A. Just then, a train approached from the Panvel side. That was a twin NKJ WAG5 hauled container train. The leading loco was WAG5 #23908. The action was hotting up, and now it was the turn of WAG7 #27088 of Kanpur to entertain us. 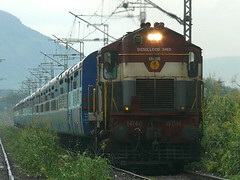 The loco rushed towards Panvel with a Container train. Just after this container train, WCAG1 #21981 rushed towards Diva with a BCNA rake. Fifteen more minutes later, WCAG1 #21977 coupled to dead WCAG1 #21975 rushed towards Kalamboli yard with a BCNA rake. It started showering down shortly after this spotting, and we had to hurriedly return towards the station. There was a flyover just before the station, and this gave us the well required shelter. Just as we made it there, WAG7 #27368 of NKJ rushed towards Vasai with a Container train. Right after this container train was a Plasser Machine which rushed towards Kalamboli. We then decided to walk towards the station as the rain was catching up more energy! The Plasser appeared to had decided to ruin our day, she was working on the Down line right outside the station! WCAG1 #21975 (which went dead a few minutes back to Kalamboli) came back to the station, and rushed off towards Diva side. It started pouring down after that, and the rain was so heavy that our pants were getting heavy and we were hugging our cameras tight to avoid it getting drenched! To add to the drama, WCAG1 #21977 (the one which tugged the dead #21975 to Kalamboli) rushed towards Diva with her headlamps on! It stopped raining a little later, and around the same time the Plasser Machine also finished her job thereby vacating the Down line. We walked out of the station and went a few metres ahead towards Diva. By now the Trivandrum bound Netravati Express was visible. The train curved around and approached the down gradient. The loco looked like an Erode one, and I was a bit sad on that! ..Thanks a lot dude for that! The 21 coacher train rushed past us pretty quickly. Just about 10 minutes later, WCAM3 pair #21956 & #21897 rushed towards Kalamboli with a BCNA rake. There was no action for about 20 minutes from then! Later on, WAG7 #27052 of Mughalsarai rushed towards Panvel with a Container train! Mayur was a bit surprised on seeing a Mughalsarai loco here! Another 10 minutes later, WDM2 #17628 rushed towards Diva with a Container train. The loco did not have any logo, but my records state that the loco was from Pune. (I had spotted her roughly a week back at Thane with a small marking stating "PA" on its cabin). Just as the container train cleared the line, we spotted WDM2 #18408 of Kalyan approaching us on the Down line. The loco was working light and is probably an inferior loco. About 15 minutes later, we spotted some loco approaching us on the Down line. It appeared like a WCAG1 to us, and we were already sick of seeing them! Karan and Mayur rushed off to get a different angle. The loco was WCAG1 #21979. Just as the loco rushed past, WAG7 #27519 of Jhansi came from the other line with a Container train bound to Vasai. I called up Panvel station, and it turned up that the next two trains that we were expecting were running late! We decided to move out and get some thing to eat. All the three of us were hungry and wanted something desperately! We moved out, and decided to check out Kalamboli yard first. We spotted a WDG4 sleeping off inside the yard. Just as we were preparing to move back, the level cross gates closed, and a WDG3A was seen closing in! That was WDG3A #13302 of Kalyan working an empty BLCA rake towards JNPT. After this spotting, we decided to return to our old place. We could not find a decent place for getting something to munch on, and decided to abort the plans for eating. Instead, we were back at our point for some more spottings....More coming up in Part 2. Second part of the report would be posted tomorrow. Images of yesterday's railfanning trip is here. Enjoy!! !